GleauxFx Glow in the Dark Powder - Buy Custom Paint For Your Automobile Or Motorcycle At Discount Prices! 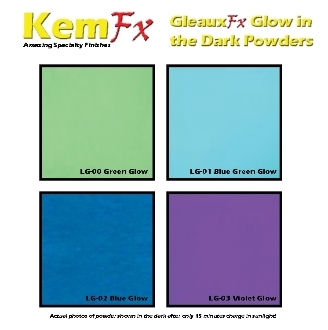 Featured in this listing is a one ounce bottle of KemFx's GleaxFx Glow in the dark powder of your choice (see chart and dropdown menu for options). This series of glow in the dark provides maximum glow intensity and longevity. These special powders glow so bright they can often be seen glowing in the daytime! Easiest application is evenly sprinkling onto wet clearcoated substrate but may also be mixed with our IC101, Pearl, Flake and Powder Binder (sold separately). 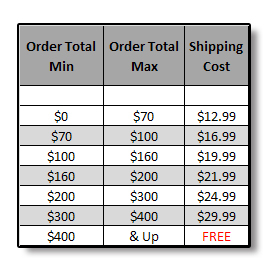 Due to the particle size and density of glow in the dark powders material will settle quickly so it must be sprayed quickly after mixing or use a gun equipped with an agitator cup. Great for graphics, pin stripes etc for a cool glow effect.